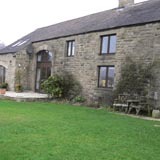 Situated in a peaceful, rural hamlet, this converted barn features extensive grounds in a dramatic upland setting. An ideal base for walking, and for accessing sites of beauty and interest. Pets, horses/ponies by arrangement. Tucked away on a private lane amidst glorious Peak District scenery, Underleigh House is a Bed and Breakfast of exceptional quality.